Editor Testimonials Current Openings Meet our Editors FAQ Apply Now! At Enago, our Expert Editors are the backbone of our qualitative excellence. 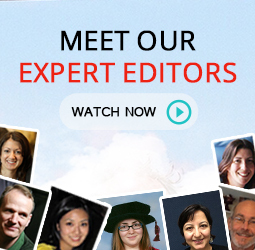 Through a series of short videos, we introduce some of these Expert Editors, where they lend insights into their personal and professional lives. These videos will also help us understand their experience of working with Enago as well as their thoughts on how freelance editing advances the quality of research and on freelancing as a viable career opportunity. Feel free to become a part of the Enago family if these videos inspire you! Enago actively promotes flexible work culture and has resultantly partnered with 1 Million for Work Flexibility. For further information on our recruitment process for freelance editors, you can provide your details in the form below. Our team will get in touch with you if your application meets our requirements. Alternatively, you can also write to us at freelance@enago.com.